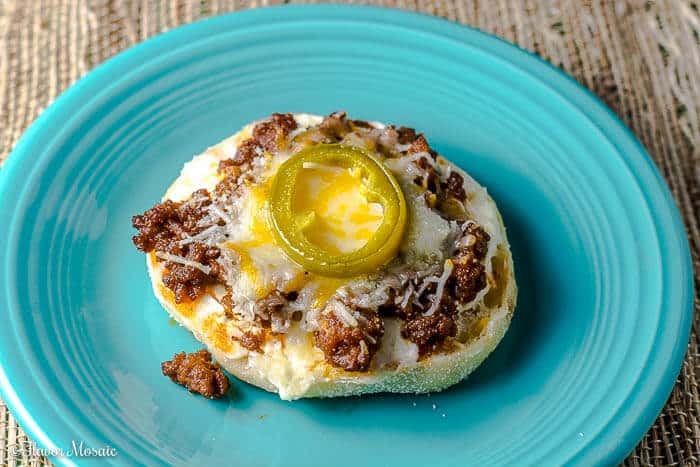 Jalapeno Popper Cheeseburger Mini Pizzas mash together two tailgating favorites, Jalapeno Poppers and Cheeseburgers, and turn them into pizza toppings on English muffins! 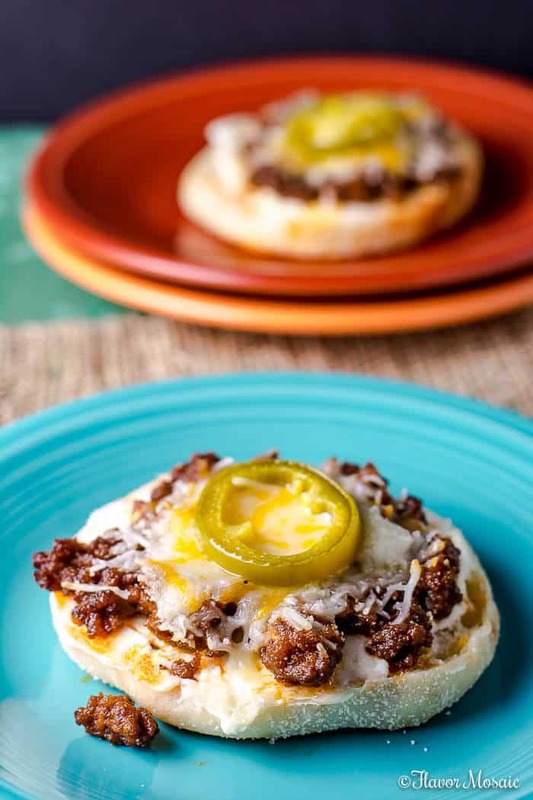 These Jalapeno Popper Cheeseburger Mini Pizzas make perfect appetizers or snacks for watching your favorite Gridiron matchup, which means it is time for the one and only, Mr. Dave, otherwise known as the Gridiron Grub Guru, to provide his football analysis while you drool over the photos of these awesome Jalapeno Popper Cheeseburger Mini Pizzas. Hello again from Gridiron Grub Guru headquarters! Last week’s big Red River Rivalry Shootout did not disappoint. Oklahoma defeated the University of Texas 45 – 40 in Dallas, while Texas A&M squeaked by Tennesse in a double-overtime nailbiter 45 – 38 in College Station. Thus, the meat of the season is upon with upcoming conference games! There are some very interesting games on the docket this weekend with #1 Alabama traveling to Knoxville to take on Tennessee. The Volunteers will be in a sour mood after last week’s defeat and will come out ready to win this classic matchup! Both of these teams have a lot riding on this game. Meanwhile, there are pivotal games around the nation with north Carolina taking on the #16 University of Miami-Florida in an important ACC Atlantic Coast Conference Game. We can’t forget the #14 Florida State Seminoles hosting Wake Forest in another ACC matchup. #2 Ohio State will be traveling to Madison Wisconsin to face a great #8 Wisconsin Badger team that so far has had a solid season. This is the marquee game in the Big Ten this week! Getting back to the heartland there are a couple of interesting matchups in the Big 12. The Baylor Bears will attempt to keep their undefeated season alive when the pesky Kansas Jayhawks come to Waco. It is best that Baylor does not look past this game because Kansas will be looking to pull an upset! The Kansas State Wildcats with a 3-2 record invade norman, Oklahoma to challenge the #19 Oklahoma Sooners who are coming off a big win against Texas. Finally, #20 West Virginia will be taking on the Texas Tech Red Raiders in Lubbock. These two teams have put up a lot of offense but very little defense. So look out for a shoot-out in Texas! That’s all the games for this week. Until next week, I hope you enjoy good gridiron action, good tailgating, and good gridiron grub! Be sure not to miss any of the Gridiron Grub Guru’s Football and Grub analysis! 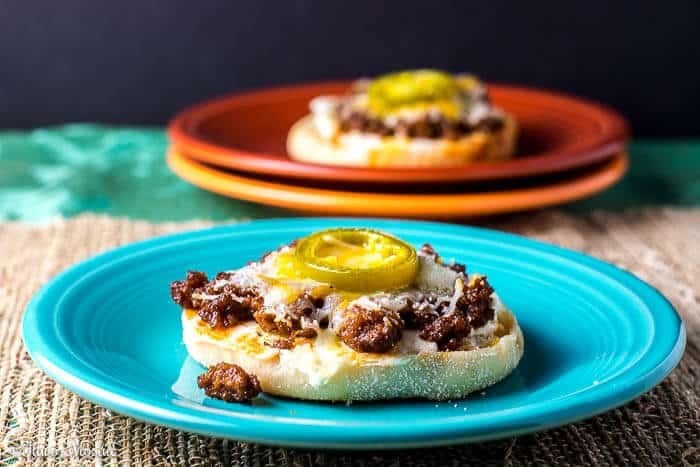 Check out these other Gridiron Grub Guru posts! 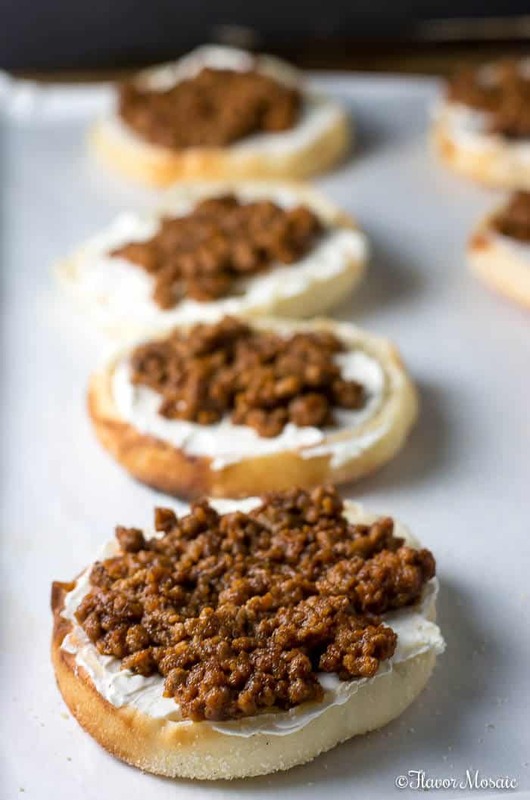 Be sure to check out our other appetizer recipes! Preheat the oven to 350 degrees F. Spray a baking sheet with cooking spray or cover with foil or parchment paper. 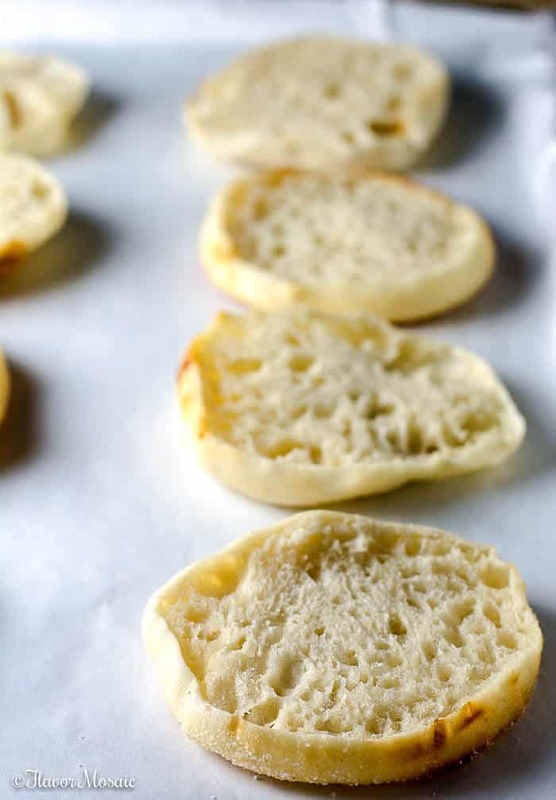 Split the English muffins in half. Lay each half, split side up, on the prepared baking sheet. 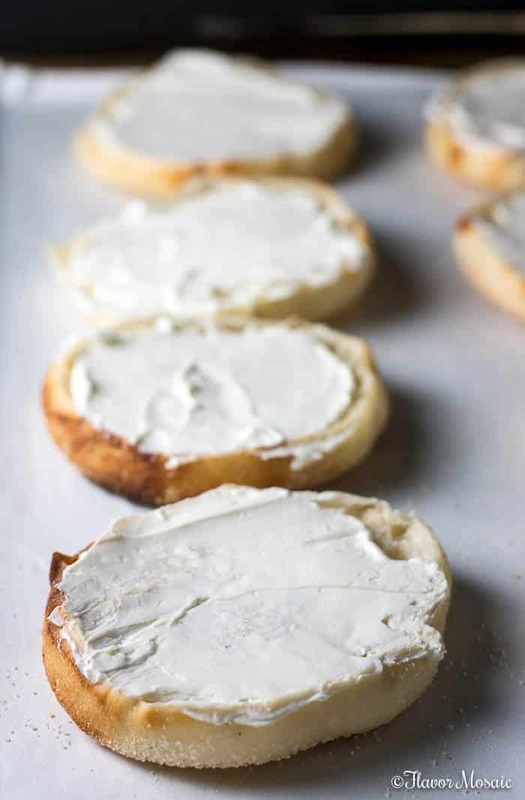 Spread about 1 tablespoon of softened cream cheese evenly on each English Muffin half. In a large skillet over medium heat, brown the ground beef. Cook until the meat is no longer pink. Stir in the ketchup and mustard until all the ground beef is covered in the sauce. 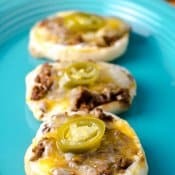 Spoon about a tablespoon of ground beef on top of each cream cheese covered English Muffin half. 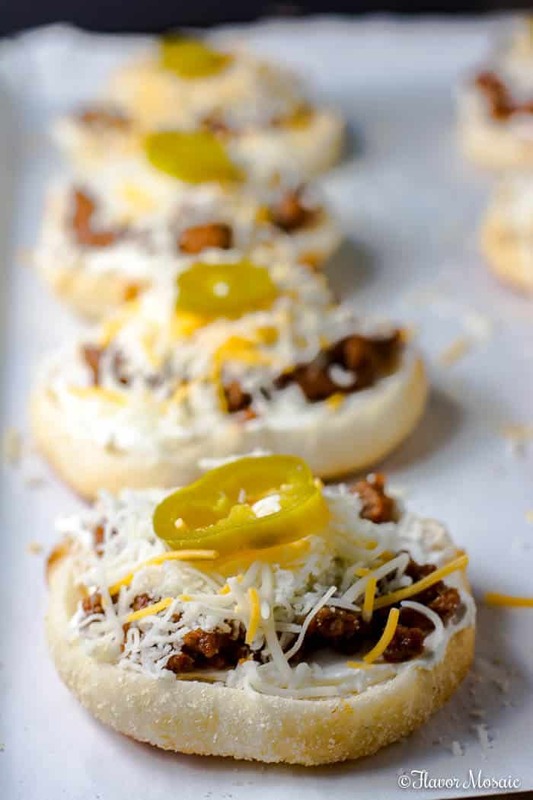 Sprinkle each mini pizza with shredded cheese. 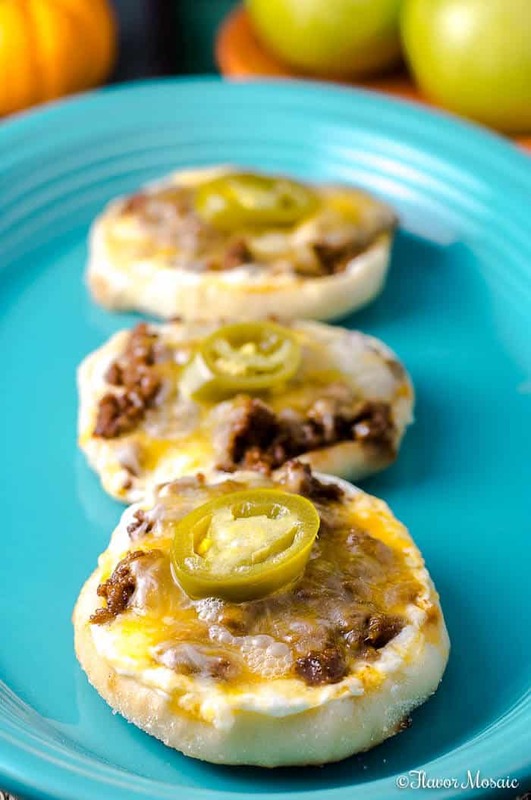 Top with a sliced pickled jalapeno. Bake in a preheated oven for about 10 minutes or until the cheese is melted and the mini pizzas are heated through. 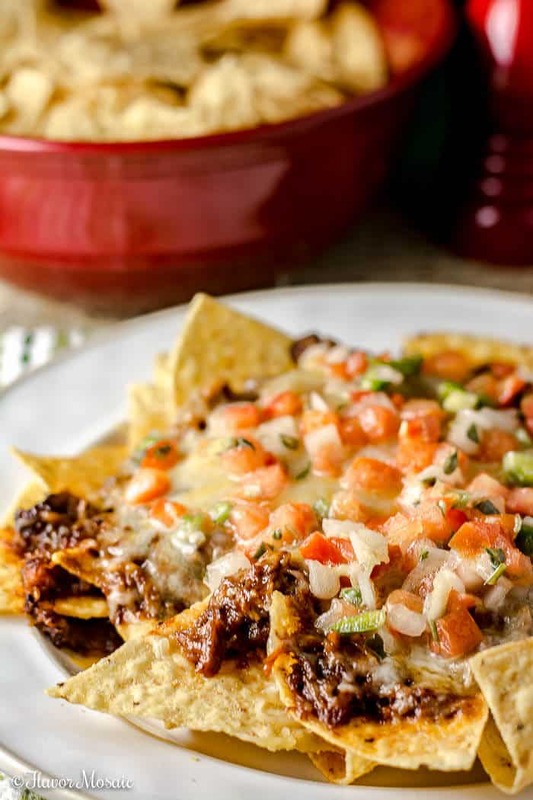 I'm the other half of Flavor Mosaic, chief taste tester, and a lifelong football fanatic, and lover of gameday food. 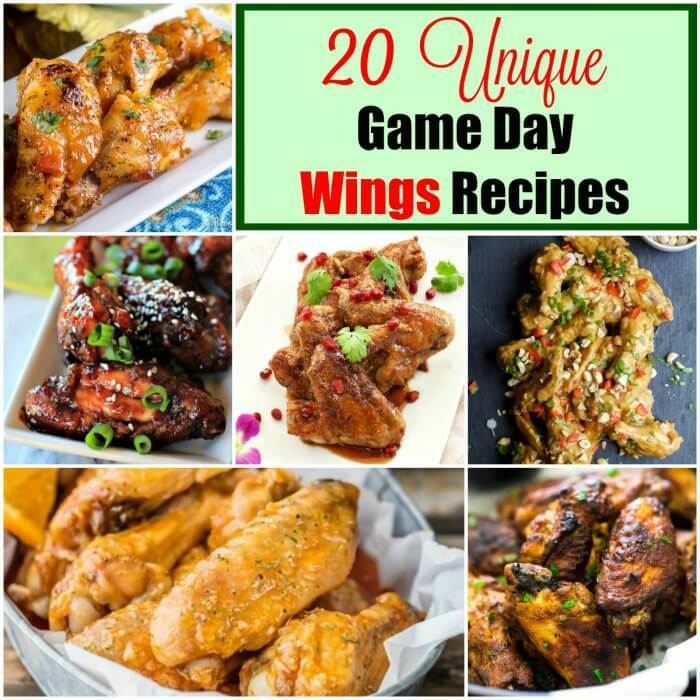 I write about college and pro football and add a side of one of my favorite game day recipes.